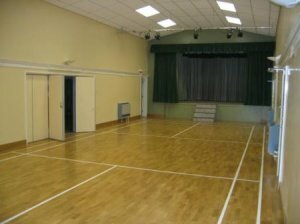 the photograph of the main hall shows the stage. The white lines delineating a badminton court have been removed. The doors on the left can be opened onto the small hall shown in the second photograph. The rooms may be hired independently of each other. 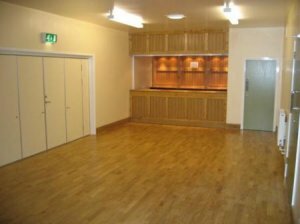 This photograph show the small hall, with the bar. The doors on the left open out into the Main Hall. HTML5 validated. WCAG compliant. Page generated in 0.1422 seconds.